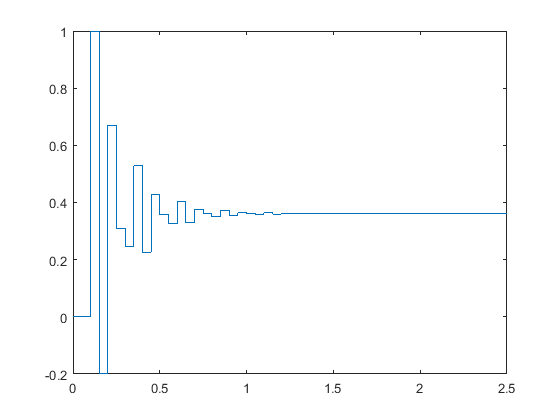 In this page we are going to explain in more detail how the pole locations of a discrete-time transfer function relate to the corresponding time response. First let's consider the following discrete transfer function with , and . 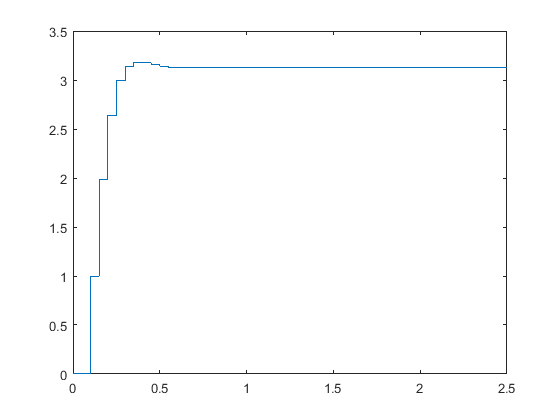 The following commands will determine and plot the poles of this transfer function. Enter the following commands to a new m-file and run it in the MATLAB command window. You should see the pole-zero map shown below. we can determine that this system should approximately have a rise time of 0.035 sec, a settling time of 0.8 sec, and a maximum percent overshoot of 70%. When you use these equations, you must convert the natural frequency ( ) from rad/sample to rad/sec. Also, these relationships are most valid for underdamped 2nd order systems with no zeros. Let's confirm these results by obtaining the system's step response. Add the following commands to the above m-file and rerun it in the MATLAB command window. You should see the following step response. The plot shows that the rise time, the settling time, and the overshoot are approximately as expected. 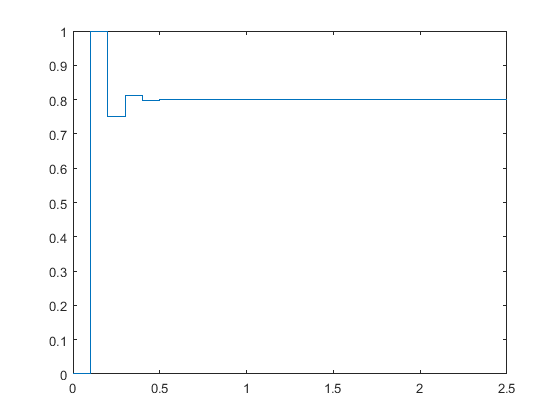 Now consider the next discrete transfer function with and . Let's follow the same steps as what we did above. Create a new m-file and enter the following commands. Running this m-file in the command window gives you the following pole map. From this pole map, we see that poles are located at a natural frequency of rad/sample and a damping ratio of approximately 0.4. Assuming a sampling period of 1/20 sec as before and using the above three equations, we can determine that the step response should approximately have a rise time of 0.05 sec, a settling time of 0.3 sec, and a maximum percent overshoot of 25%. Let's obtain the step response and see if these are correct. Add the following commands to the above m-file and rerun it. You should see the following step response. Once again, this step response shows the rise time, settling time and overshoot that we approximately expected. For the last example, let's consider the following discrete-time transfer function with and . Just as before, enter the following commands to a new m-file and run it in the MATLAB command window. You should see the following pole-zero map. From this plot, we see that the poles are located at a natural frequency of rad/sample and a damping ratio of approximately 0.8. Once again assuming a sampling period of 1/20 sec, we can determine that this system should approximately have a rise time of 0.1 sec, a settling time of 0.3 sec and an overshoot of 1%. Let's confirm this by adding the following commands to the above m-file and rerunning it. You should see the following step response. The resulting step response again has roughly the shape predicted. Using these three examples, we proved that the pole locations can be used to get a rough estimate of the transient response of a system. 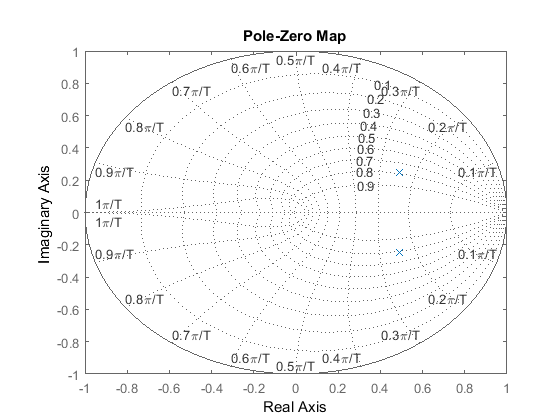 This analysis is particularly useful in the root-locus design method where you attempt to place the closed-loop poles to obtain a satisfactory response.